Swelling in the arm is a common symptom for breast cancer survivors who have had lymph nodes removed from the arm pit/breast area as part of their treatment. However, there is an easy way to use self-massage to help pull some of that fluid out of the arm and back into the torso. 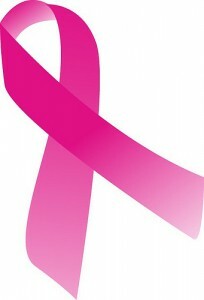 In honor of Breast Cancer Awareness month, I wanted to share this information with breast cancer survivors. This self-massage video will help with fluid retention in the arm, forearm or hand, whether it’s from an injury, surgery or pregnancy. If you’ve had surgical removal of lymph nodes, please contact your surgeon or physician to see if self lymphatic massage is an option for you. If you’re experiencing extreme edema, consult a certified Lymphatic Drainage Massage Therapist before using this routine on yourself. Below the link to the video is a link to a list of contraindications for Lymphatic Drainage Massage. Please review them before using this on yourself. How would you like to know the top acupressure spots to use for Repetitive Strain Injuries (RSI) in the forearm? I ran across this list of applicable acupressure points on About.com. 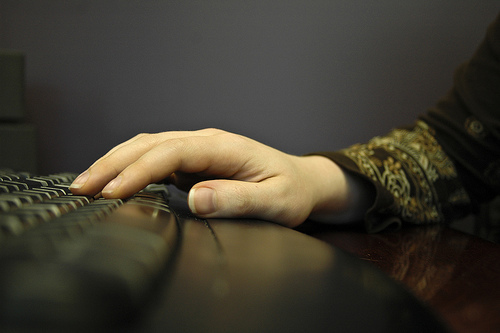 RSI injuries are caused by the wear and tear of a set of motions (like typing, hammering, etc.) on the body. Usually the motions are not physically taxing at first, but over weeks, months and years, muscles shorten, tendons lose their flexibility or become inflamed, and nerves become pinched by the tissue around it. Bend your arm so your palm faces your chest. The point is at the outer end of the elbow crease. From LI 11, draw an imaginary line to your thumb. The point is 3 finger widths down this line. Feel the area for the most tender point. Make a fist, bending your elbow slightly. The point is at the elbow crease on the outer side of the tendon. Why Vampires Like Massage Therapists. . .
I’m a big proponent of fascial massage. Fascia is the connective tissue that surrounds our muscles, our organs, our bones, our arteries and veins: pretty much everything. I usually describe it as a Saran Wrap that holds things in place and directs force through the body. It’s incredibly helpful to release fascial restrictions and adhesions from injuries. But, it can be a challenge to do fascial work on yourself. Many types of fascial work involve holding onto the soft tissue/connective tissue/muscle and moving other tissue in a different direction to create a pull or stretch of the fascia. How exactly do you hold part of your soft tissue still while moving it yourself? Enter the sacrum fascial stretch self-massage. 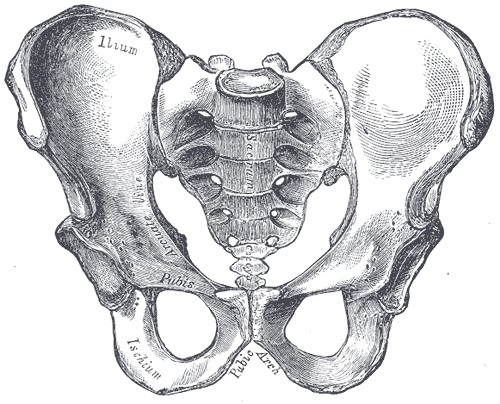 The sacrum, the triangular bone at the center of the pelvis, sits at the base of the spine. Because of its shape and position, it is responsible translating the vertical effects of gravity from the legs to the torso, and it’s also part of the support structure that keeps you upright and mobile. The sacrum meets the two wings (illium) of the pelvis and connects to the tailbone (coccyx). Since the sacrum has so much to do with balance and movement between the upper and lower half of the body, it’s often a part of the body with restrictions and adhesions leading to lower back problems. In this case, to stretch the fascial tissue connecting in to the sacrum, we’ll press the sacrum up against the wall and use the pressure of the body to hold the tissue in place while we lean forward, (or to the side or diagonally – whichever feels best) and pull the tissue with a slight forward bend. The details follow in the video below. One thing I didn’t mention in the video is that if you’re having a hard time “tacking” the fascia on the sacrum down so you can get a good stretch, get a small section of rug gripper and put it between you and the wall. That will keep your clothes from sliding so much and give you the friction you need to perform the fascial stretch. If you’re a massage therapist who enjoys fascial work with your clients, this fascial stretch of the sacrum can be a life-saver for clients suffering from lower back pain and limited range of motion. Plus, it just feels good. Please share!